Weaving looms! A pair of them. Well it was bound to happen. It just completes the trinity of weaving, dyeing and spinning (having tried and tested, if not yet mastered the first two). Such are the dangers of ebay browsing! The first is a small vintage loom that sits in it’s own wooden box with a lid and sort of folds out. 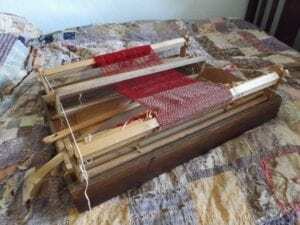 It’s a light and simple 2 way loom with a rigid heddle (mastering the terminology already) basic and compact but should in theory weave up to 20″ wide. There are no labels giving any clues as to age, but 1930’s at a guess. With the help of Youtube videos, a fair bit of bad language and a couple of false starts it’s now been ‘dressed’ with a warp. The holes in the heddle are tiny and didn’t come with a proper threading hook – using a small steel crochet hook worked but isn’t ideal. So a threading hook is definitely on the shopping list. But there is a little practise weaving going on already. All very basic and random just to get into the swing of things. 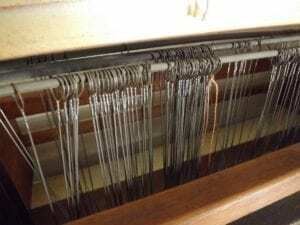 A major snag is that the rollers that hold the warp threads at the back and the completed fabric at the front are too loose and won’t hold the work at a decent tension. A couple of chocks to wedge the cogs might solve the problem (raids the kindling baskets for off-cuts of wood). So far so good. That’s something to be getting on with. The plan is to play about with different yarns in the weft. There’s no shortage of yarn stashed around here, and also try a few rag strips maybe, who knows. The first real project will probably be cushion covers – nothing too ambitious. Meanwhile the table loom (aka the ‘beast’) sits in the corner. 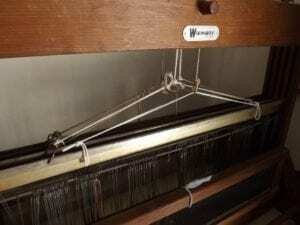 It’s a Weavemaster 4 Shaft Table Loom (1950’s? ), daunting and full of moving parts that need to be operated in the right order. All this will have to wait a while until time and courage permits. It’s not actually that big, about 68cm wide, 56cm and 50cm high. 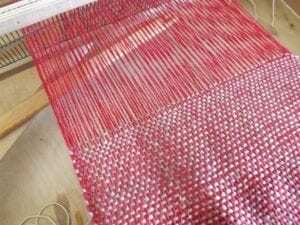 It will weave up to 50cm (20″) wide. 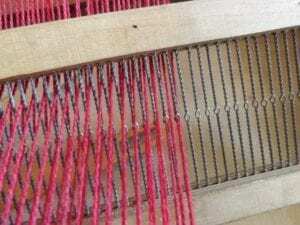 The shafts make it possible to weave more interesting patterns – twills and such – more easily than on the small loom. So much to learn, so much to explore. And on the shopping list – warping pegs and a threading hook. Spinning, Dyeing and Weaving – The ‘Project’ from start to finish.